Battling climate change was a signature issue of President Barack Obama’s tenure, particularly during the his second term. In contrast, President-elect Donald Trump has called climate change a hoax perpetrated by the Chinese, vowed to roll back climate regulations such as the Clean Power Plan (CPP), and threatened to withdraw from the Paris Agreement. As Trump's inauguration nears, many wonder if Obama’s climate legacy will endure. 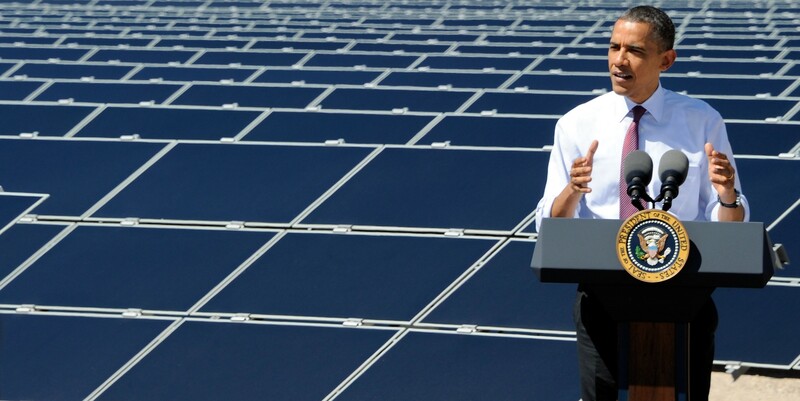 When Obama took office in 2009, one of his priority issues was transforming the landscape of US energy – putting the US on a path to cutting its greenhouse has emissions by 80% by 2050. He came tantalisingly close to getting a comprehensive, economy-wide cap-and-trade legislation to meet this goal in 2010. That legislation ultimately failed and when Republicans won control of the House in 2010, the prospects for comprehensive climate change legislation disappeared. As a result, in President Obama’s second term the administration urgently sought climate solutions that didn’t require legislation, leading to the adoption of the CPP, new methane regulations, the first regulations promoting deployment of renewable energy on federal lands, new fuel economy standards for heavy-duty vehicles, the continuation of robust fuel economy standards for light-duty vehicles, and a host of other measures. These efforts, along with the appointment of long-time climate advocate John Kerry as Secretary of State, put climate change at the very top of the US domestic and international agendas. The trajectory of US greenhouse gas (GHG) emissions is drastically different than when President Obama took office in 2009. At that time, the Energy Information Administration (EIA) estimated that US GHG emissions would grow 500 million tons per year above 2008 level by 2030 – topping 6200 million tons per year. As Obama leaves office, US emissions have decreased nearly 600 million tons below the 2008 level and the most recent EIA estimate projects US emissions falling a further 400 million tons per year by 2030 under President Obama’s policies. The decrease in emissions over the past eight years was the result of a variety of factors (including the global economic downturn, changes in the US economy, and the rise of cheap natural gas displacing coal in electricity generation). But as his term comes to the end, it’s clear that President Obama’s policies have helped transform the emissions path of the US. Unfortunately, because Obama was forced to pursue climate policy through executive actions, it is easier for a subsequent president to undo those actions, which is precisely what Trump has vowed to do. But the new President will not be able to completely erase Obama’s climate legacy. While there are some changes that President Trump can make with the stroke of pen, amending or repealing finalised agency regulations takes just as much time and effort as promulgating those regulations in the first place. In fact, completely repealing regulations soon after they were finalised may be more difficult. Regulations are supported by voluminous factual records that an agency cannot ignore. This means an agency must develop a new record to justify changes to regulations or risk having those changes thrown out by a court. Nonetheless, given enough time and political will, the new administration (aided by a Congress now controlled by the Republican Party) will likely succeed in changing or undoing at least some of President Obama’s most high-profile climate measures. Even if they do, however, it won’t fundamentally change the new US emissions path. For example, even if the CPP and the new standards for light- and heavy-duty vehicles were all successfully repealed, US emissions in 2030 would remain roughly equal to what they were in 2015. A flat emission path for the US would be a tragedy, since the world needs to accelerate its progress in reducing emissions to avoid the most catastrophic effects of climate change. But it would remain a remarkable transformation compared to the US emissions outlook when Obama took office. While Obama’s leadership was key to forging the Paris Agreement, the Agreement appears robust enough to survive without the US. The election occurred during the 2016 UNFCCC conference in Marrakech. The election of a man that declared climate change a hoax and promised to withdraw from the Paris Agreement inspired no shortage of despair among climate negotiators from around the world. It also inspired another feeling: resolve to continue combatting climate change. China, in particular, has signaled both the importance of proceeding with the Paris Agreement as well as its willingness to lead on climate if the US won’t. Even though Obama wasn’t able to put the US on track to reduce emissions by 80% by 2050, during his presidency the US (and the world) has undergone a transformation. It is no longer in question that economic growth can be achieved with declining GHG emissions. Obama can’t claim credit for all of this transformation. But he exercised bold leadership at a key time to support and accelerate that transition. He fundamentally altered US emissions trends and positioned the US as a diplomatic and business leader in the emerging global clean energy economy. The question for the incoming president is whether he will ultimately cede US leadership and business opportunities to China and other global powers that remain committed to combatting climate change.